Libya – Since the beginning of the crisis in 2011, insecurity has been rampant in southern Libya and, as in many crises, young people and children are among the worst affected. 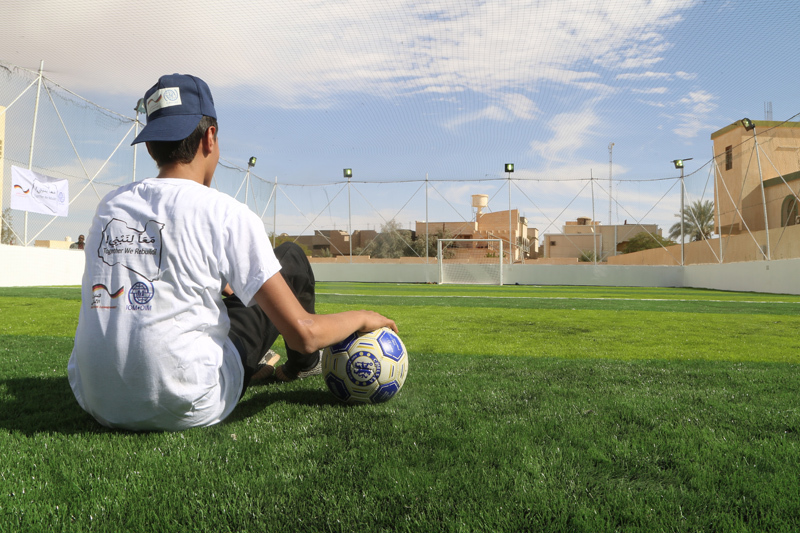 To provide safer and accessible public spaces for young people and children to play in, IOM, the UN Migration Agency, has built three football pitches in the Sabha and Qatroun districts. The chronically instable situation in southern Libya is compounded by intercommunal conflict, among other major challenges such as shortages of basic services, lack of rule of law and collapsed institutions. 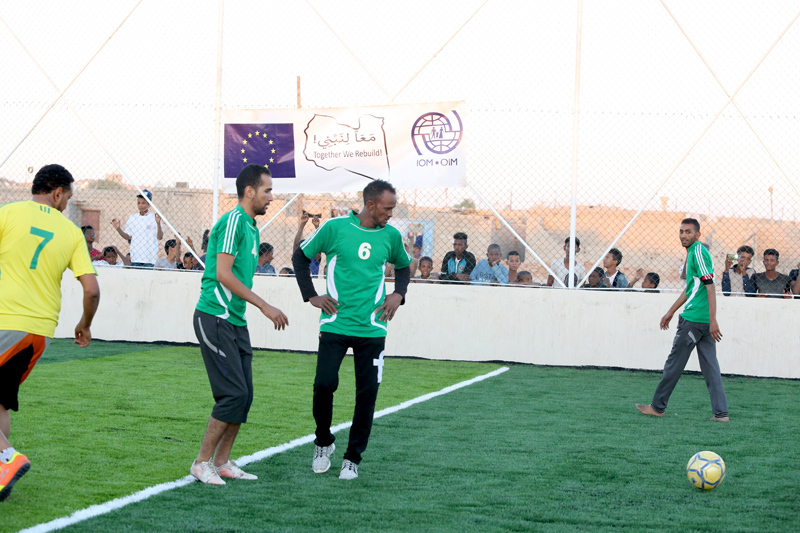 Through local meetings, communities in Sabha and Qatroun raised the need to IOM for public spaces where young people can safely practice sports regardless of their ethnic background. They hoped that playing together might also improve relations between different ethnic groups. Recreation spaces also be a great asset for psychosocial support to conflict affected youth. In answer to this request, the development of recreational public spaces began and was closely coordinated with and supported by the community representatives, local authorities and Councils to which IOM handed over the playgrounds. The construction of the pitches by three local construction companies, supported by the European Union and the Government of Germany, was completed at the start of January 2018. 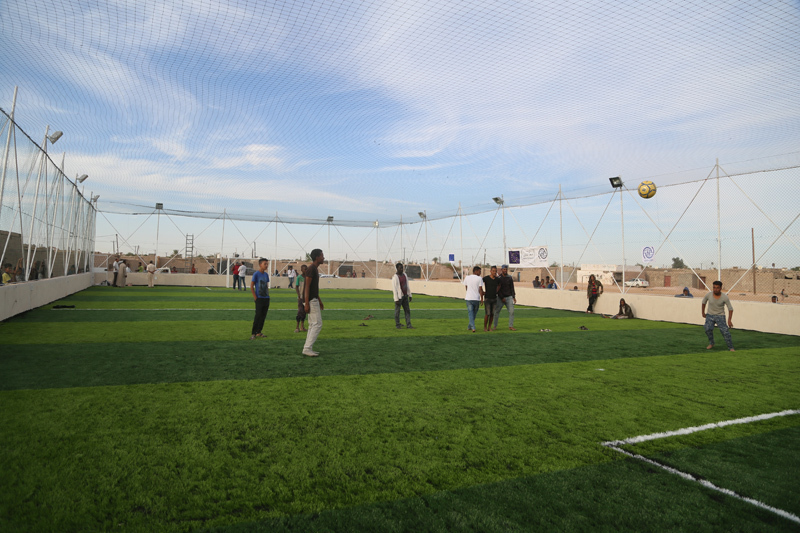 “Communities in our neighbourhood are excited by this new facility, especially the children,” said Omar Mohammed Almelka, CMC member and representative of Alkarama area in Sabha, where one of the pitches was built. “IOM is the first agency to take on a project like this in the area and we hope the support continues with other projects that benefit our communities,” added Almelka. 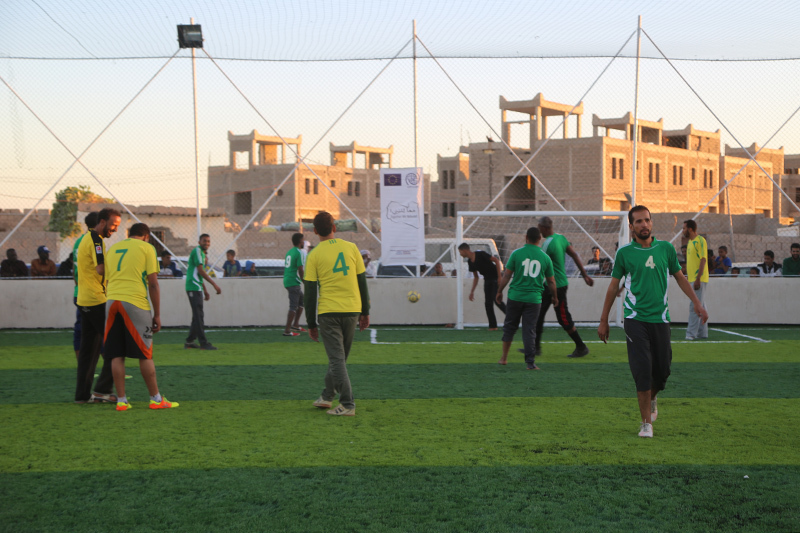 Football is one of the most popular sports in Libya but most neighbourhoods in Sabha and Qatroun districts lack sports facilities. For example, young people in Tayouri in Sabha, including Tibu (ethnic group), Tuareg (ethnic group), internally displaced persons and migrants, used to be forced to travel long distances on highly insecurity routes through areas still heavily affected by the ongoing conflict to reach the closest sports club. Now, more than 5,000 young people are able to enjoy a game of football safely close to where they live on the three new pitches. 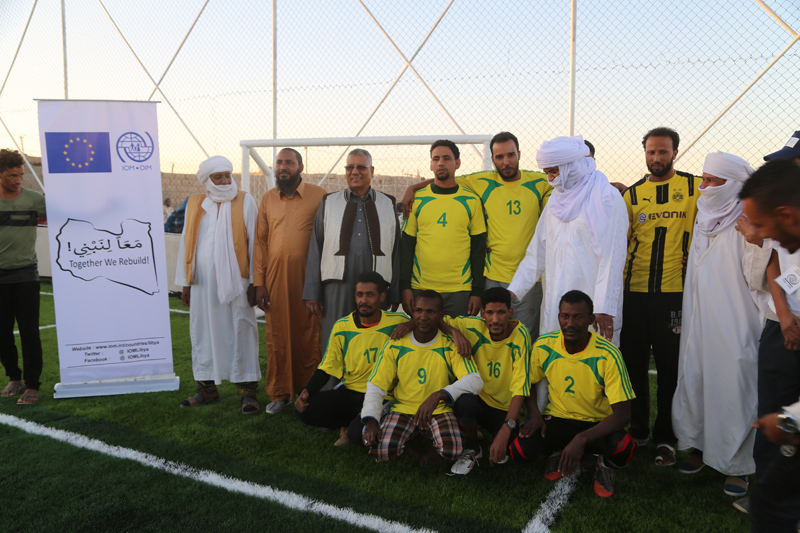 “It is now our duty as the local communities to work together to protect this facility for our future generations; we should take care of it as it belongs to all communities around Sabha and not exclusively to the Tayouri neighbourhood,” said Shoaieb Musa, a civil society activist in Tayouri neighbourhood present during the handover ceremony of the football pitch to community. Over the course of 2017, IOM organized sport activities and tournaments in recreational centres and schools. Some 1,500 children aged between 10 and 17 years participated in sports tournaments in 2017 and 15 schools were rehabilitated and two recreational centres were built by IOM. In May 2017, IOM, in cooperation with local stakeholders, also organized a peace festival in southern Libya, in which different tribes, along with internally displaced persons and migrants, celebrated unity and peaceful coexistence. Building upon last year’s activities, 2018 will see an increasing focus on youth engagement and social events targeted to them with the aim of bringing together various tribes, families and backgrounds in support of community cohesion and stability in southern Libya.